Chambly is having bad run and we have contrast situation with Frejus St. Raphael here. 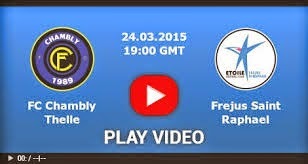 The visitor is unbeaten in last 11 match and I don't see they will fall today.I think Frejus will win this one, but still I protect my stake with DNB. The visitor will give it all in order to remain in the league.